Four strong, forward-thinking women with unique stories were honored at the 12th biennial Phenomenal Women Awards at California State University, Northridge on Oct. 22. 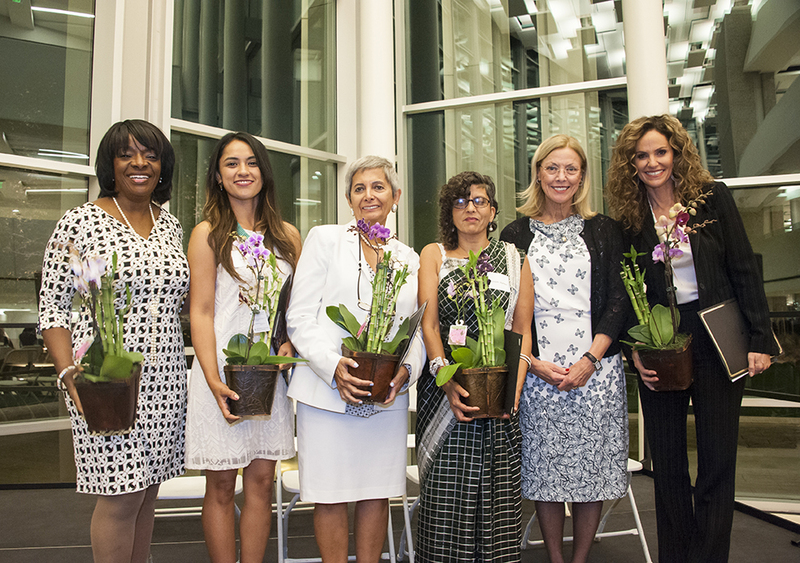 Actress and activist Amy Brenneman, muralist Kristy Sandoval, attorney and activist Mehrangiz Kar, and food justice organizer Neelam Sharma each received the award at the reception held in the Grand Lobby of CSUN’s Valley Performing Arts Center. Brenneman said that having grown up in a family of activists — her father was an environmental lawyer and her mother a judge and the basis for the television show Judging Amy — when she saw an opportunity to use her talents for good, she went for it. Brenneman created the CHIME-a-palooza gala to benefit the CHIME Institute, a charter school housed at CSUN, and got involved in reproductive rights activism. At the awards reception, Brenneman told the audience that her father recently had passed away, and she referenced him many times in her acceptance speech. The reception and awards fundraiser featured a silent auction with a variety of items, including an autographed baseball, Disneyland tickets and restaurant gift certificates. Additionally, tickets to the Broad museum, a gift pack from the Los Angeles Rams and gift baskets were raffled off and awarded to attendees by mistress of ceremonies Beverly White of NBC4 News. Proceeds from the event benefited the CSUN Department of Gender and Women’s Studies and the Women’s Research and Resource Center. The department was well represented, with chair Breny Mendoza delivering a speech where she introduced members of the faculty in attendance — highlighting that CSUN has one of the most diverse Gender and Women’s Studies departments in the country. “At CSUN we are very proud of our Gender and Women’s Studies department and the Women’s Research and Resource Center, and their commitment to diverse issues and fields of study related to women’s issues and social justice,” said CSUN President Dianne F. Harrison, adding that she is the university’s third consecutive female president, which is very uncommon in higher education. Diversity was also highlighted by the honorees, especially Sandoval, a Latina muralist from Pacoima who is an advocate for arts education and public art. “Growing up I was told, ‘You’ll have it twice as hard — you are a woman and a minority, so you might not make it at what you want to do,’” Sandoval said. Sandoval recently became the first woman to have participated in the Mural Istanbul Festival in 2015. She urges the young people with whom she works to follow their passions like she did. Kar, an attorney, writer and activist from Iran, also followed her passions. As a women’s rights activist in the country after the 1979 Islamic Revolution, she fought for human and women’s rights as a lawyer and journalist. After being arrested in Iran, Kar moved to the United States, where she continues her activism. She is currently teaching a class in the Gender and Women’s Studies department at CSUN. Though each of the awardees were very different, they have exhibited passion and tenacity in their work that is truly phenomenal. The final award was delivered to Sharma, who is a food activist in South Central Los Angeles. Sharma’s speech highlighted how important collaboration was to her success and how there are many amazing women who work silently and do not get acknowledged.